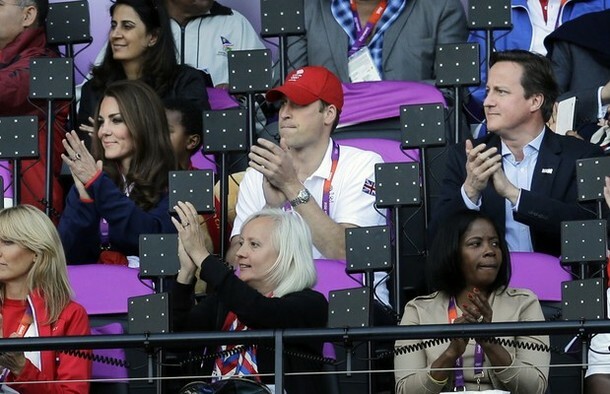 William and Kate watched the athletics at Olympic Park tonight. Kate was scheduled to attend the hockey earlier today but this was cancelled as she went yesterday. There was applause in the stadium when the couple arrived. Also in attendance were Prime Minister David Cameron (as you would have gathered from the above tweet :)) Princess Anne and Stella McCartney. An aerial view of the park. 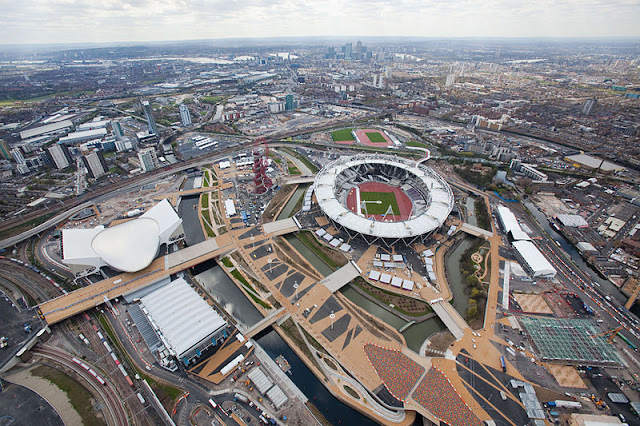 Click here to see a panoramic view of the stadium. Move the picture to see an all round look. Kate is wearing her Team GB fleece, navy jeans and pearl drop earrings. 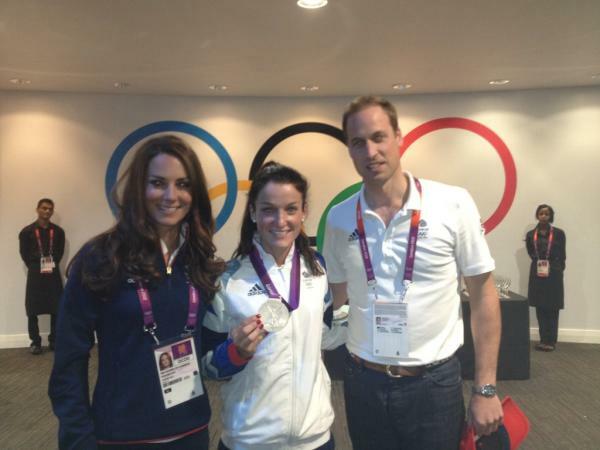 The Cambridges congratulated silver medallist Lizzie Armitstead who described the couple as 'even more lovely and beautiful in real life'. A huge congratulations to Lizzie and Jessica Ennis who won a gold medal for Team GB. 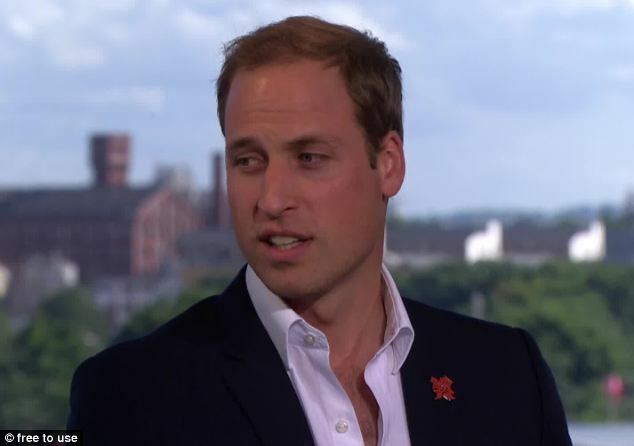 Many of you were interested to see William and Harry's interviews from yesterday. To view the BBC interview please click here. The Channel 9 interview is here and Click here to view the Canadian CTV interview. 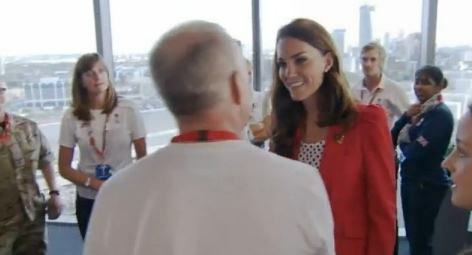 You can view a video of William and Kate's visit to Team GB house at ITN Source. 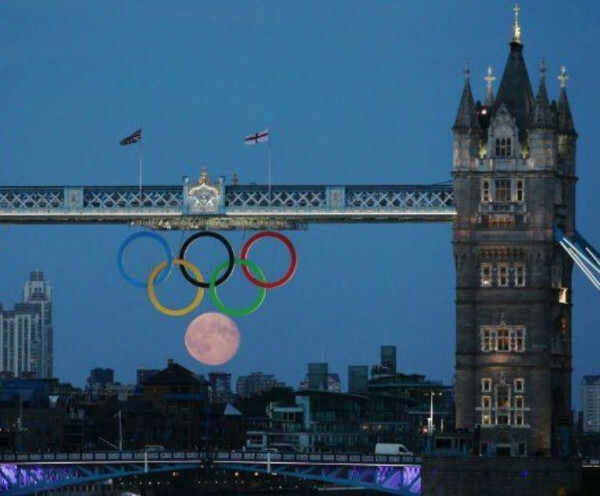 Finally Tim Montgomerie photographed London Bridge with an additional ring. The moon works wonderfully in this lovely shot. I find it hilarious that they booed the PM. I'm over the moon with that last photograph! Thanks once again, Charlotte, for all the speedy, complete and sensitive coverage. The photos of the Duchess are wonderful, but you have included so much more for those of us not in London, giving us a more intimate view of all that is going on. Well done. Thank you so much for the posts and photos. 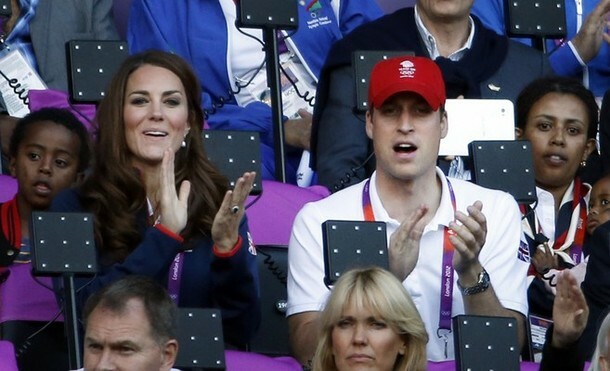 William and Kate are as cute as ever. They are really doing a great job and what a nice couple they are! Great Britain is a beautiful country that I love and visit every year! It's really amazing the 3 gold medals in an hour or so. Congratulations! heyy charlotte!fast as always!btw do you know where i can find really big photos or wallpapers with the duchess? Check out Zimbio for a great selection of big photos! Thank you so much for posting those video links. I was wanting to see the one where William talked about the Kiss Cam. Hello from Canada - I check your site everyday and you never disappoint! Thank you so much for your wonderful coverage, links to videos and fine commentary! I would have loved to see them on the kiss cam. I bet William would not have kissed his beautiful Duchess. He is to much of a private person. But they have been showing alot of PDA. But kissing he would draw the line, I think. Watching them during the track & field events, they looked serious at times. Not much PDA in pictures today. A few showing them giving eachother that "loving look" but no hand holding that we coudl see from the photos. Maybe we will see them tomorrow at tennis. We will get alot more PDA then. Oh Charlotte I did write a comment that is not posted, did you not get it? Also can you give me the link to zimbio for the pictures. Thanks again for this great blog. I will double check the comments but there appears to have been something wrong in the couple of days. I'll look into it immediately. So much pictures to see! So much impressions! And - as the people commented before - Charlotte you're so fast and up-to-date! Wonderful job!! Look at this disrespectful article: http://www.dailymail.co.uk/news/article-2183401/William-Kate--Harry-Its-3-people-marriage.html.Does the media only intention is to end the marriage of William and Kate? It makes me very sad.